As for Me and My House. . . . Losing the Super Bowl at the one yard line on a dubious play call was not the way Seahawk fans imagined the outcome of that game, and the relentless rain for the past week has mirrored the shock and sadness and downright gloom that the city feels. It got me thinking about how communities–even nations–can act as one mind and heart sometimes. Last year, Seattle grieved as one when a mentally ill person attacked students at Seattle Pacific University, even killing one, despite having no grievance with the school at all. Our nation grieved together after the 9-11 attacks. The world reacted as one in shock and compassion in response to events like the 3-11 tsunami in Japan a few years ago. Sometimes, a city or state or nation will seemingly act as one in its turmoil. The Bible mysteriously refers to both individuals and nations being responsible for their actions and thoughts–something that always puzzled me. How can it be both? Living in our individualistic-minded nation, I could easily relate to the idea of personally being responsible for my choices relating to my faith, but it was much harder to see how “nations” could be held responsible in the same way–surely, there were individual people in those judged nations who were on God’s side, weren’t there? Now fear the LORD and serve him with all faithfulness. Throw away the gods your forefathers worshiped beyond the River and in Egypt, and serve the LORD. But if serving the LORD seems undesirable to you, then choose for yourselves this day whom you will serve, whether the gods your forefathers served beyond the River, or the gods of the Amorites, in whose land you are living. But as for me and my household, we will serve the LORD. Joshua 24:14-15. He spoke on behalf of his whole household–presumably, as was common in the ancient world, extended family and even servants or others who might be attached to the household in some way. Perhaps by doing so, he was declaring his hope that this attitude of serving the LORD would be true for each individual in his household, and that together, they might encourage and help shape the declared faith of the other tribes of Israel and the individuals within those tribes. 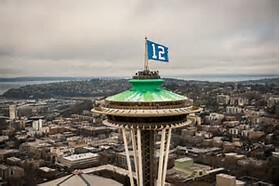 Well, as a Seattleite who was finally turned into a football fan just in time to be crushed by the outcome of Super Bowl 49, I appreciate being part of a city who feels things together deeply. Perhaps this mystery of “as for me and my household,” individual and community, means a little more to me this week as well. When was a time when you were part of a community that acted as one? Share it in the comments! The image credit goes to http://www.sbs-seattle.com. On Sundays, I post an article-type post on themes in the novels: faith, friendship, diversity, etc. This entry was posted in Bible Stories, Faith and tagged Faith, Joshua, Seattle Seahawks, Super Bowl. Bookmark the permalink.